The text for this article is likely longer than most of the things I'm linking to - tiny pieces of algorithmic sculpture that makes things like elevated look positively obese. A Mind Is Born - 256 byte audiovisual demo for the Commodore 64, with a full writeup of its inner workings. If that's too much for you, there's always the 23 byte (yes, twenty three byte) Wallflower, coincidentally also for the Commodore 64. 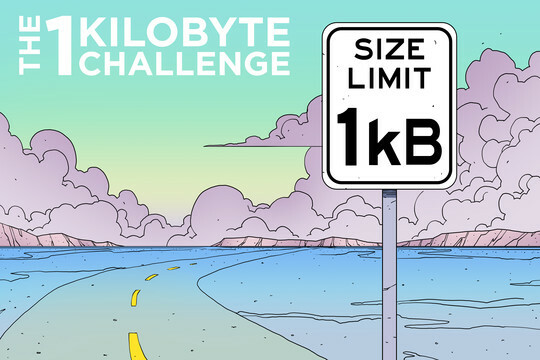 1kB Challenge: and the winners are... - the implementations of all those previous tiny demos are cheating in some respect, in that they're relying on operating systems - from the modern (and gigantic) to the vintage (and merely small). But what if you don't have such luxuries as gigabytes of software libraries, or even kilobytes of mask ROMs in hardware peripherals? Hackaday's 1kB challenge saw to that, with the winner making use of an ultra-compressed character set for visual output on an LCD. Mini Rhinoceros Kit - lumbers slowly but gracefully into the wind. No English instructions, but the pictures are pretty informative - and the English text online for the previous one points out potential pitfalls more clearly. Construction is pretty similar, although not identical. Strandbeest USA Web Shop - looks like they're also available here much more cheaply, but I've no idea what delivery is like. I need to build up an army for releasing on to windswept beaches around Seattle. Is this how Strandbeest reproduce, through human dispersal of tiny Strandbeest nymphs? THE FORM OF THE DANGER IS AN EMANATION OF ENERGY. WHAT IS HERE IS DANGEROUS AND REPULSIVE TO US. THIS MESSAGE IS A WARNING ABOUT DANGER.